Coffee Amici is a great spot to meet your friends, new clients, or business partners on any day in Findlay. Coffee Amici provides free WiFi so you can work on a project or stay connected all while being comfortable. Coffee Amici takes pride in being the number one destination for live music in Findlay. 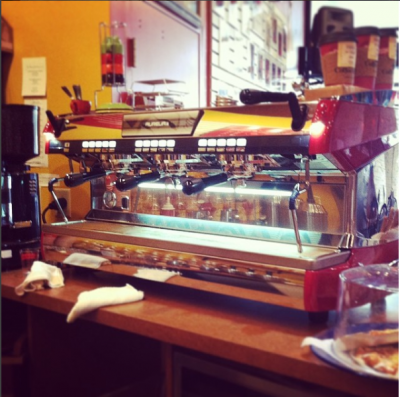 Let one of our baristas make you the perfect drink with our high-end Espresso machine. It doesn’t fake it and gets the job done quickly so you can keep your day going. Ever since 1991, we’ve served Crimson Cup Coffee & Tea out of Columbus, Ohio. They import only the finest coffee beans from around the world to Columbus, roast them carefully by hand at their worldwide headquarters, then deliver fresh-roasted beans to customers across the country. Error validating access token: Session has expired on Saturday, 08-Dec-18 04:59:28 PST. The current time is Thursday, 18-Apr-19 09:34:01 PDT.